Your adventure begins the moment you step aboard. With nearly 900 staterooms with balconies, you'll awaken each day to a new horizon. Experience the relaxed ambience onboard and tantalizing cuisine in our elegant dining rooms. Enrich yourself with Discovery at SEA™ programs and unwind at the The Sanctuary, a tranquil haven reserved for adults. 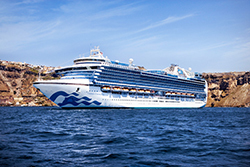 One of the best-known names in cruising, Princess Cruises first set sail in 1965 with a single ship cruising to Mexico. Today, the line has grown to become the third largest cruise line in the world, renowned for innovative ships, an array of onboard options, and an environment of exceptional customer service. A recognized leader in worldwide cruising, Princess has been awarded “Best Cruise Line Itineraries” by Recommend magazine for eight consecutive years and “Best Cruise Line in Alaska” by the readers of Travel Weekly magazine. Princess offers approximately 1.3 million passengers the opportunity to escape completely to the world’s most intriguing destinations including Europe, Australia & New Zealand, Alaska, Asia, India, Africa, Hawaii, Tahiti and the South Pacific, the Caribbean, the Panama Canal, Canada & New England and South America.